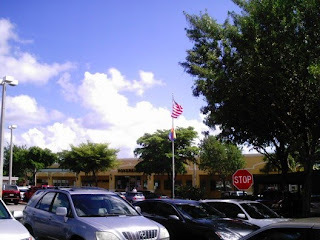 Wilton Manors is an Island - there are two rivers that goes around the entire town. Its is also a very hot gay spot. A place where Gay men and Women can walk hand in hand and not have fear. In the picture below it s an American Flag and right below it was a Pride Flag. 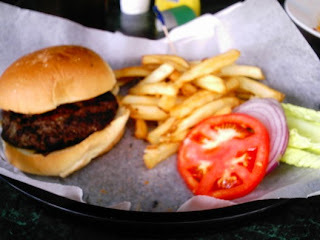 We ate at Georgie's Alibi, I ate a Hamburger and drank Iced Tea. The cost was $10.00. The food was excellent and the experience was excellent. We enjoyed ourselves so much. We went to a few other gay owned places such as Gay Mart, Pride Emporium, Bottoms & Tops, Java Boy's. There are many more that we did not go into this trip. We just wanted to see if we could find it. Tomorrow I am going back to Wilton Manors to look for a job. I am also going to the beach and look for work there. I will keep you posted on that. Hi Allen! I am so jealous LOL, but really happy for you. I hope to visit those places some day! I don't think you need it, but good luck in the job hunt! Just think, you can park and just walk from business to business filling out applications. Thanks for the updates, and looking forward to your next post. Good luck with the job search! Keep us posted. Sounds divine Allen. Good luck on the job search! it was good to read your post. You seem to be having a good time; I'm relieved. Mystery seems to be settling in well. Twiggy wasn't happy and let me know by peeing on my dirty clothes but I was expecting it. At least it was only once. This mornin Mystery joined Twiggy, MoMo and I on the bed and Lila came in to check us out; one big happy family!!! Elsie isn't doing so well though, she's having problems breathing again only it's been much worse in the last day Q said. Say a prayer for us, we are for you. I hope you do well in your job hunt, too. I did not know such a place as Wilton Manors existed. It is totally opposite of our city. You would not be comfortable and happy here and I would feel the same way about Wilton Manors. But I do like reading your blogs. Your writing is always interesting. Good luck in your job quest! @ John, Its been so great. I am really starting to enjoy myself. @ Beth, Thank - I hope I can find one soon. @ AC, I pray for you two every night! @ MissLynda, Thanks for that. Hey - stop by my blog. I have an award for you.